AZZL is a brain-teasingly clever puzzle game featuring lovingly designed animations and characters. This post is brought to you by Jutiful, maker of AZZL and other smart games. Much as candy makers know what taste buds they’re appealing to, game makers have learned what makes people respond. Similarly, the “animation puzzles” in AZZL make it feel like a game that’s also a confection: sweet and a little addicting. AZZL is a new iOS game from Jutiful that’s built to please, cleverly combining simple puzzle mechanics with lovingly designed animations. These animations serve as a moving version of the picture on a puzzle box, shattered into tiles of various shapes and arrangements, all kaleidoscopically mixed up. As you make sense of the colorful, constantly shifting image, it resolves into the beginning of an animated scene, usually some clever gag or fun perspective shift involving silly but delightful animated characters. Sometimes, a jumble of moving dots and orange lines resolves into a top-down view of a skateboarding cartoon wombat or something. Or alternating triangular shards of blue and yellow reorganize into a nervous furry monster sweeping a flashlight, only to be relieved to find another monster in the dark. It’s silly, but surprisingly fun. 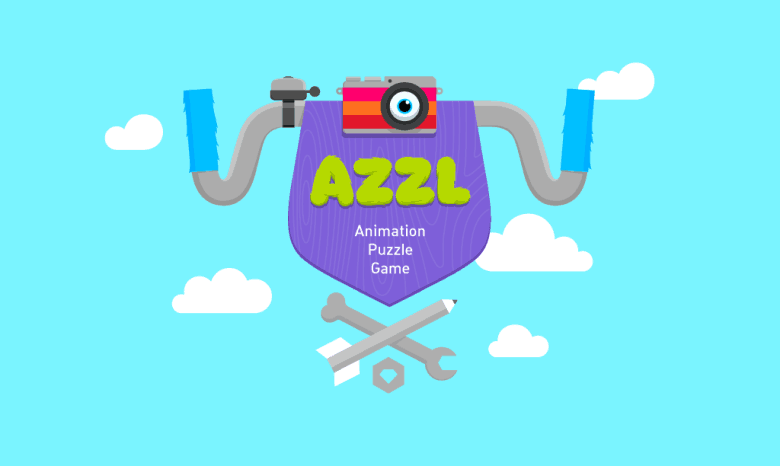 AZZL is a cleverly designed, brain-tickling puzzle game built around lovingly designed animations and characters. The creators call AZZL’s roughly 100 levels “stories,” and it makes sense. Part of the satisfaction of playing comes from releasing a pleasing little narrative arc at the end of the puzzle. The characters and overall visual design are really well-conceived and fun to interact with. The whole thing is carefully (and effectively) designed to press your buttons, to “extract the most Yays Per Minute,” as the AZZL website says. The stories in AZZL are laid out in a series of “worlds” a la Super Mario Bros. 3, each themed around a kind of puzzle and loaded with a colorful, lively landscape of its own — a mountain range, an island, a castle. The worlds vary enough in content and difficulty that it’s easy to find yourself jumping from place to place looking for the next twist. AZZL achieves what its makers set out to do: The game is an utterly satisfying way to take your head out of the real world for a moment and get sucked into a fantastical one that’s hard to leave. The animations are entertaining and the characters are charming. The puzzles are surprising, making inventive use of the animations in ways that’ll keep you guessing. If you’re looking for a satisfying, addicting and fun new game, we recommend you give AZZL a play. The trailer below will give you a taste of the animated action.